600cfm with pre-filter, carbon filter and 99.97% efficient HEPA filter. Integrates into the air/heating system. The 600HS unit is recognized as the most effective whole-house and stand-alone HEPA filtration system on the market. 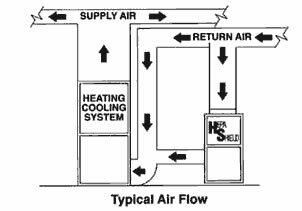 It is also the first system to be used for the introduction of fresh, filtered air, well before HRV systems were introduced. Simply by adding a 6″ duct from the outside to the 12″ diameter inlet of the 600HS unit, you can now have both the best filtration system and the ability to introduce from 72,000 CF to over 150,000 CF per day of fresh, filtered air into your home or office WITHOUT compromising energy costs. By adding only 50 cfm of fresh, filtered air through the 600HS unit, you can bring in 72,000 cfm of air per day into the average home. This small amount of air has no negative affect on the performance of the furnace or air conditioning system as it represents approximately 4% of the total air going through the average heating/cooling system. This means you can now have a system that combines the best filtration technology and carbon absorption with a method to introduce fresh, filtered air. A cost savings of up to $1,500.00. Multi-Purpose Applications: The 600HS can be attached to any heating/cooling system up to 4 tons. It can be used with up-flow, down-flow, attic or crawl space system and… even in stand-alone configuration. Can be mounted horizontally or vertically. Installation would be by a local HVAC contractor of your choice. 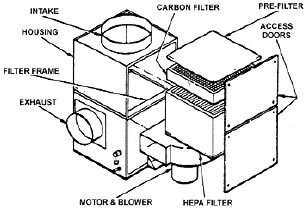 » The HEPA filter removes 99.97% of all particles 0.3 microns and larger. » Integrates into the air/heating system. 600HS PLUS Options: » Adaptation of 600HS base unit allowing for two speed operation with programmable home thermostat. 600HS Stand-Alone Options: » Adaptation of 600HS base unit used to tie into a separate system without a thermostat. 600OA Options: » Contains 20lbs of odor adsorbing carbon and no HEPA filter. Used for odor control. 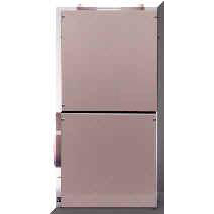 600OA PLUS Options: » Adaptation of 600OA base unit allowing for two speed operation with home thermostat. 600OA Stand-Alone Options: » Adaptation of 600OA base unit used to tie into a separate system without a thermostat. 600 Options: » 600HS 3/4hp system.